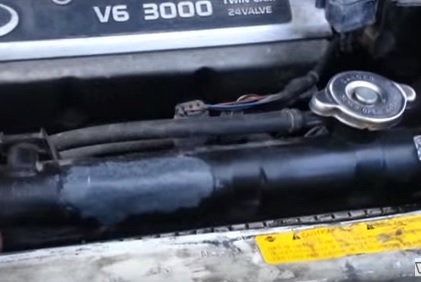 A leaking plastic radiator can be fixed with DIY kits or even with a soldering iron. 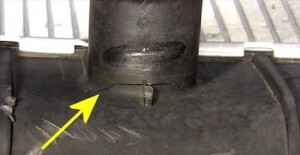 Often when a leak is seen on a plastic radiator many think it must be replaced when it can be repaired at home easily. Repairing a leak is a easy task that most and DIY backyard mechanics can do. There are three ways to repair a plastic radiator. 1… Use a soldering iron to melt the plastic back into place. 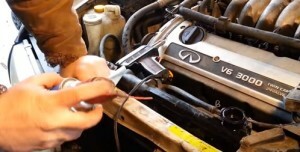 2… Use epoxy that melts into the radiator fixing the leak. 3… Solder the leak then apply epoxy. If you have a soldering iron than putting your soldering skills to work would be the cheapest option. For those that don’t have a soldering iron they are low cost items. Using epoxy also has good results. The epoxy melts into the plastic sealing up the leak. Many kits are available such as this one on Amazon. The third option is the most common fix since it doubles up on the leak making it last much longer if not for good. Drain the radiator if the fluid is leaking out as the spot needs to be dry. Clean the spot that is leaking and get any grease removed from the location. WD-40 or similar can be sprayed at the target which cleans it up nicely. A soldering iron is than used to go along the leak melting the plastic back together and sealing it. It will depends how big the crack is as to how much melting of the plastic needs to be done. After melting the plastic testing it to see if it is still leaking is the only way to know if its fixed. Often epoxy as in the next method is done also to make sure the leak doesn’t come back. Using epoxy is a common method which is chemicals that when combined causing a reaction that generates heat melting everything together. Epoxy has the added benefit of adding more material to a leak which can be a problem when the walls of a radiator are too thin. Mixing the substances tougher that come in a kit is a straight forward easy job. Be sure to get the area clean before applying it. Fixing your own radiator is a big money saver especially when looking at replacements. Most leaks are simple to fix and can be fixed within a hour or so. Joints can be harder to repair but the same principle is used. Often a joint is harder since they are in a inconvenient location which sometimes requires removing a part that is in the way. Removing the entire radiator for hard to reach spots is the best way to fix it. Having good access to the problem area is ideal. Have you fixed a plastic radiator before? Let us know about it in the comment below. I have not ever repaired a radiator b4 but due to finances am going to give it a try. My car is not overheating but a hairline crack is now spewing coolant and smells hot. Do i need to drain radiator 1st? Thanks for your thoughts. Have a Sabaru rad. tank with a 1/2″ crack. Looking for some options.